The 100 Barbel Challenge: A challenge I decided on after several multi-catch sessions at the start of the season - with limited time could I catch 100 small river barbel? I wasn't after big fish (although if I found one I'd definitely target it), it was all about getting a bend in the rod with mostly 1-3 hour trips. 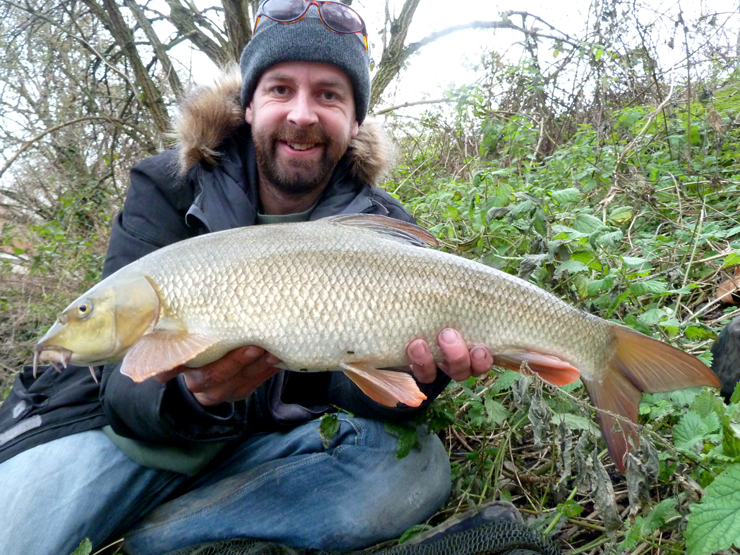 And I cracked it on February 12, after 20 trips - 101 barbel for 395lb 15oz - an average of 5 barbel per trip - brilliant! Fishing the whole river there were a few recaptures, but not many. 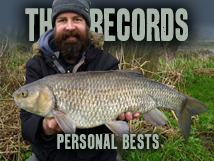 The 500lb of Barbel Challenge: With a month left I had planned on sitting on a couple of swims targeting a double, but then I realised I was only 4lb away from 400lb I decided to keep going (with bigger barbel in the back of my mind). After all, if I could catch another 10 barbel I'd have a 10% margin which would more than cancel out any recaptures. And I settled on a new target of 500lb. I managed 6 more trips and cracked it on the last one (and continued fishing for a few hours) - 532lb 11oz - an average of 20lb per trip. What a fantastic season. Where were the big barbel? I have a theory; in the past the bigger fish, especially the doubles, have mostly been caugh after sunset. Full stats breakdown is here. Cheers Paulos, it was great turning a quick escape to the river into a great challenge - and cracking it. I could only get near a big barbel in the dark and yet Martin had quite a few not far away in daylight. I'm planning more trotting for them next season, what bait worked best for you ? Good result anyway, nice one Brian. All of them fell to luncheon meat - they like it and it's easy to roll. I was lucky, I saw about 50% of them take the bait. But what I found even more fascinating was watching them take the free samples. They seem very suspicious of a static bait, they nudge it and wait for it to move - might explain the little knock you often get before the big bite while ledgering. And their movement is really restricted up and down stream, perhaps 6 inches - but they will move across the flow almost the width of the river to intercept a bait. I've adapted the line I fish over the last couple of seasons - I used to try and bounce it off their head but now I roll it about a foot to their side - it seems if you can make them move for it they are more committed to taking it. Plan on taking these observations onto The Wye and Royalty next season, actively searching for barbel instead of waiting for them to come to me - even when I can't see them.